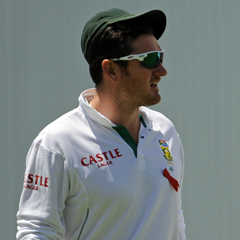 Cape Town - Roughly a year ago, and perusing South Africa’s Test itinerary for the next 12 months or thereabouts, you might have been tempted to speculate that round about now Graeme Smith could just step down as captain of South Africa. He had been dropping increasing hints, after all, that a time would come for him to focus on his batting alone in the five-day arena. At the time, the Proteas aspired to be No 1 in the rankings, rather than actually boasting tenancy of the slot, and signature away series loomed in England and then Australia. Both have now been successfully negotiated, with South Africa securely at the top of the pile and Smith boasting the singularly unique distinction, in fact, of leadership of successive series triumphs in both hallowed cricketing countries. Next up are significantly less stressful - at least on paper - home summer assignments against New Zealand and Pakistan, which might have shaped some time ago as perfect opportunities for the big left-hander to hand over the reins and focus on simply, deservedly plumping up his robust batting average (49.53 after 105 Tests) even more. Yet such has been the ongoing lustre of his team’s challenge under his command, and his own form at the crease simultaneously confident and consistent, that there is an almighty case for asking: what would be the point? Or perhaps even more pertinently: why fix something that ain’t broke? It is not as though Smith has reached any kind of mental or physical sell-by date: although it may seem as though he has been around forever because he accepted the national captaincy at a uniquely tender 22, he is still only 31 which means that five, six or seven years of top-flight activity probably remain within his grasp if he wishes to have them. There have been varying periods in his tenure when he has seemed to go just a little “stale” both as leader and batsman, but these happen to just about every cricketer on the relentless treadmill that is the modern international roster. Kirsten had also revealed that Smith’s partial scaling-down of Proteas captaincy, by giving up the chore in the limited-overs environment to AB de Villiers, had “freed up his batting more”. Just as he had come to light with the blade in England - where he so often does - with a century and two half-tons in the three-Test series there, Smith made major runs in two of the three contests in Australia more recently, including 122 in the first innings at Adelaide and 84 in the second at Perth where the series was so powerfully sealed. Certainly you got the impression from Australian media reports that respect for Smith only blossoms in that hard-to-please country, after one tour prior to the 2008/09 duck-breaker when he was treated with some hostility even as his team got routinely thumped. “Biff” won many new Aussie friends, for instance, for the guard-of-honour arranged for Ricky Ponting as he took to the WACA crease for his last innings and the suitably muted decorum that greeted his dismissal fairly shortly afterwards as his illustrious career ended minus a fairytale knock. It has taken some painstaking years, but South Africa are finally where Smith has always wanted them to be: undisputed in their status as No 1 in the most coveted form of the game and now seeking to stay there. He would be daft, frankly, not to want to stay a pivotal character in a team at the peak of its powers and hoping to make the phenomenon last; it is the least he deserves. Besides, no especially logical current candidate in the side sticks out for the captaincy should Smith decide to give it up - De Villiers will presumably only want to bed down his already demanding dual role as top-five batsman and wicketkeeper in the Test XI, whilst prolific-scoring Hashim Amla clearly far prefers vice-captaincy to the fullest “Monty”. No, I believe the way is clear for Smith to press on as a genuinely big character of the game and such an obvious, increasingly wise commander of troops. Expect him, all having gone well on the fitness front against the Black Caps earlier, to become the first Test captain ever to reach 100 caps in that capacity (he is currently on 97) when South Africa entertain Pakistan in the first Test at the Wanderers from February 1-5.